They never snicker behind your back about that unfortunate outfit you wore, or comment on the couple of extra pounds you put on over the holidays; they’re always happy to see you, even if you’ve only been gone 20 minutes. The pets in our lives give so much and ask so little – why not make something special for them? 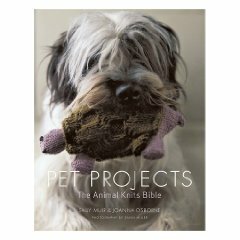 Pet Projects: the Animal Knits Bible by Sally Muir and Joanna Osborne is packed with all kinds of ideas for special gifts for your pets. They run the gamat from practical (dog coats and collars) to fanciful (a tent for your turtle) Dogs get the most attention, but there are toys and pillows for cats, a blanket for your prized horse, even a tiny (adorable) knitted house for your hamster. Most patterns are for knitting or crocheting, but there is also some embroidery and a section on re-purposing old sweaters into dog coats. All of the projects have a touch of humor, for instance there is a rug for your cat except instead of a bearskin, it’s shaped like a mouse-skin as if your mighty hunter had slayed a giant rodent. Or take a look at the “Anti-Firework Dog Balaclava”, a snood-like hat with extra earmuff protection to muffle loud, scary noises. It’s all charming, adorable and whimsical – much like your favorite four-legged friend.